So I posted this on mytabletennis but I came to realize there are many people here who might also appreciate it. I have compiled a list of rubbers that I know of so far that have a speedglue effect sponge with the caveat that they are 1.6mm or thinner. As one can imagine, most of them are pips. - MUST be 1.6mm or thinner. 1.7mm+ does not count. - All rubber types are allowed, both inverted and pips of any length. Last edited by GeneralSpecific on 09 Feb 2018, 01:37, edited 5 times in total. some of the Dr neabauer rubbers are speed glue effect and thin. A very useful list, especially for the inverted rubbers, where thin 'glue effect' rubbers are hard to find. My take on why such rubbers are rare. People speed glue to increase spin and speed, and perhaps control (depending on what one means by "control", of course - control over the table isn't the same as control over landing hard loops). The "glue effect" sponges were designed to mimic this. Thin sponge has LESS speed and spin than thick sponge, and more control over the table and perhaps for chopping. I'd argue that you could get the same degree of extra speed and spin by increasing sponge thickness slightly (to perhaps 1.8mm or 2.0mm) rather than using a "glue effect" sponge, and recognizing this, manufacturers have avoided offering, say, Rasant Turbo, Evolution MX-P and Tenergy 05 in 1.0 or 1.5mm sponge because one can achieve the same thing using, say, Sriver in 1.8 or 2.0mm. I suppose there is a weight penalty, and I'm not sure if 1.0mm Tenergy 05 would give more "control" than 1.8mm Sriver. Another one for the list, Xiom Vega Intro comes also in 1.3mm. PHYS-BLASTO??? 47.5 degree sponge, looks pretty hard. The 1.3mm seems to be something new. I've seen it on the distributor website only, so it might not be sold anywhere as yet. I’ve got some Intro, sponge is on the hard side of medium, some glue effect is present but minimal compared to your average Tensor. The official manufacturer page lists 1.3 so that's enough for me to add it to the list. You can look through my list of thin inverted rubbers (see below). I didn't limit the list to speed glue effect rubbers. Since you include pips, Yasaka's RakzaPO that Mattias uses I think qualifies. The new Waran II maybe? Haven't tried it. I see you listed Dtecs. I think (others confirm) that most (all?) of the ESN Long pips have "speed glue effect" type sponges. Like Joola Badman, Piranja, Xiom Guillotine, etc. Is Guillotine discontinued? If the ESN LPs are mostly speedglue, then most of the ESN SPs should be as well, no? Rakza P.O and Waran II do not go below 2.0mm. 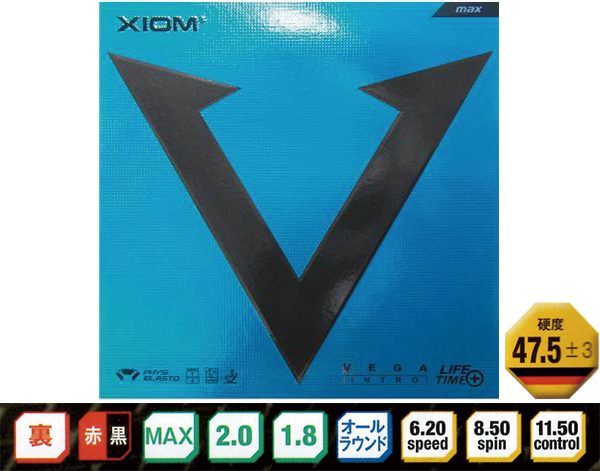 Xiom Guillotine is discontinued and has been replaced with Vega LPO. If I can get confirmation on Badman and Piranja, I will add it to the list. Having used both Xiom Musa and Vega Europe I found Intro in red 1.8mm just to be a faster harder Musa i.e. a speed glued classic rubber feel rather than tensor. Very little dwell or grab on ball leading to flat trajectory and not easy to generate spjn unless you have fast hands. Ah...haha. Forgot the thin part on the Rakza PO. Duh. I like the way they feel and play. I think they are rare and often overlooked. I wanted to create something that someone could google and get information about. I can't tell you how many times I've tried to search for something and couldn't quite find what I was looking for. I wanted to help out whoever is reading this now and in the future about a topic rarely considered. Maybe even myself, years from now.